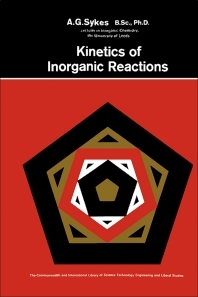 Kinetics of Inorganic Reactions provides a comprehensive account of the mechanisms of inorganic reaction. The book is comprised of 15 chapters that deal with the two main fields of inorganic reaction, the homogeneous gas-phase reactions and solution reactions. The first chapter of the text provides an introduction to some of the basic concepts in inorganic reaction, which include the mechanisms of a reaction, reactions in different phases, and the feasibilities of a reaction. Next, the book details the experimental techniques and treatment of data. The next series of chapters talks about gas-phase reactions. The book also dedicates a chapter in covering various types of reactions, including isotopic reaction and redox reaction. Chapters 12 to 14 deal with substitution reactions, while Chapter 15 talks about acid-base reactions. The text will be most useful to chemists and chemical engineers, particularly those who deal with inorganic chemistry.